Our camp provides a safe, nurturing environment for your children. While at our camp, your children will take field trips to the Brunswick Rec Center to swim, enjoy reading time at the Brunswick Library, take nature walks, and care for the community garden. Plus, they will enjoy fun learning activities to strengthen their academic knowledge. Each week of camp is centered on a theme such as cooking, science, sports, and nature. In the upcoming weeks, we will be announcing additional activities that will be new to the program this year. Your children will grow spiritually, physically, academically, and socially while gaining collaborative skills through team building activities. Our discipline policy follows that of Saint Ambrose School. Copies will be included with the registration packet. Our summer camp is open to all K-8 grade students. 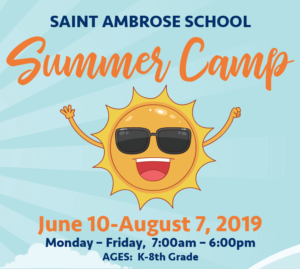 Campers must be 5 years old by June 30, 2019 or entering Kindergarten this fall. 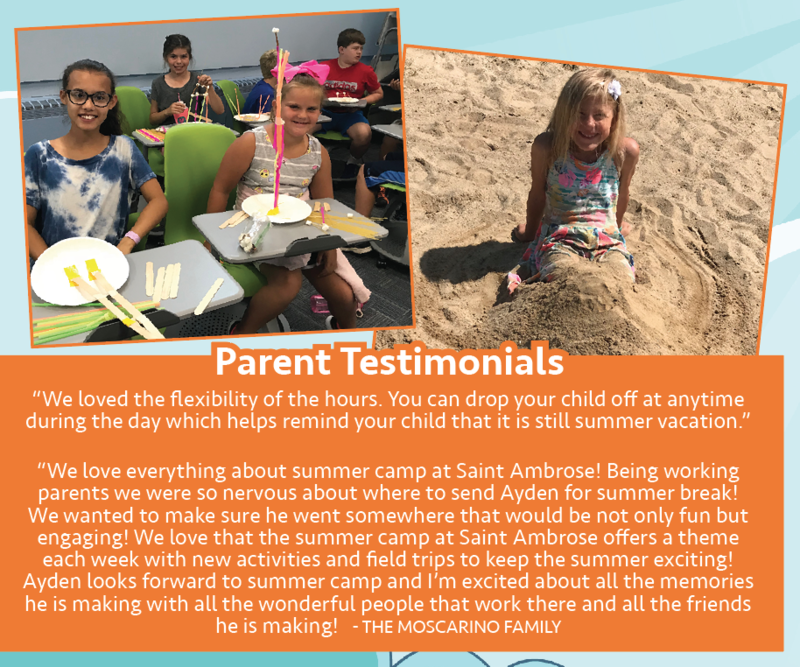 A family who may not need child care for the entire summer but would like to have a “back up” plan, may pay the full non-refundable registration fee and will be allowed to bring your child/children for any day you may need to. The daily rate will apply and is due the day of service. Ages 5-12. Must be 5 years old by June 30 or entering Kindergarten for 2019-20 school year. Fee includes registration and t-shirt. FEE IS NON-REFUNDABLE. Payments will be withdrawn from your account a week before camp starts (June 7). If the ACH Tuition Program is stopped for any reason, you will be required to make payment in full to the camp by the first of the month following termination of the ACH Tuition Program. **If you pay monthly, a 3% discount will be given off of your monthly total. 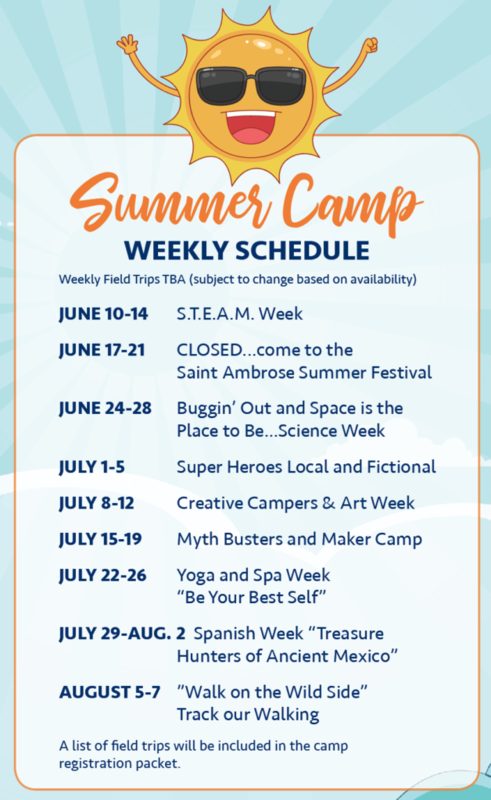 ***If you wish to pay in full for all weeks of camp, please pay by June 7, 2019 and a 5% discount will be given. To be considered part-time, your camper may come 3 days or less a week. Otherwise, you will be charged full-time weekly rate. Four days or more is full week rate. If you need last minute child care, please call the camp the day before. Payment by check is due the morning your child(ren) attend camp. This option is available for registered families only. Snacks: Two snacks are provided. If your children have any food allergies, please pack an extra snack in case we do not have any allergen-free snacks on a given day. Lunch: Hot lunch is provided Monday through Thursday at no additional charge. Please bring a packed lunch on Fridays. Other Information: Students will be involved in several activities throughout the summer. They will need a water bottle, sunscreen, and a backpack which will be kept with them at all times. Although sandals are permitted, flip flops are not permitted except for water days.